FDA Moves To Ban Menthol Cigarettes, Flavored Cigars : Shots - Health News In its latest effort to curb smoking by young people, the FDA wants to outlaw menthol cigarettes. The agency would also restrict sales of flavored e-cigarettes to reduce youth addiction to nicotine. 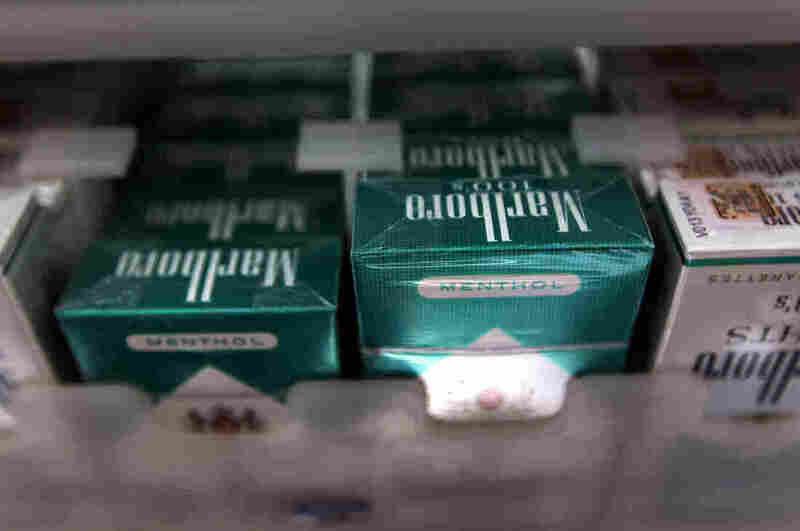 FDA Commissioner Scott Gottlieb said he wants to ban menthol cigarettes because teenagers often become addicted to nicotine by smoking them. "Today, I'm pursuing actions aimed at addressing the disturbing trend of youth nicotine use and continuing to advance the historic declines we've achieved in recent years in the rates of combustible cigarette use among kids," Gottlieb says. "These data shock my conscience," Gottlieb says. "I believe these menthol-flavored products represent one of the most common and pernicious routes by which kids initiate on combustible cigarettes," Gottlieb says. Several groups, including the NAACP, endorsed the FDA's plan even before it was officially announced. "For decades, data have shown that the tobacco industry has successfully and intentionally marketed mentholated cigarettes to African Americans and particularly African American women as 'replacement smokers,' " the NAACP said in a statement. Several cigarette companies that market menthol cigarettes didn't immediately respond to requests for comment. In the past, they have vigorously opposed any effort to ban menthol cigarettes. "We continue to believe that a total ban on menthol cigarettes or flavored cigars would be an extreme measure not supported by the science and evidence," said a statement from Altria Group Inc., maker of Marlboro Menthol. "FDA's decision to move forward with a ban on menthol cigarettes is one of the most significant public health actions that the FDA has taken in years and will have a greater impact on the death and disease caused by tobacco in the United States than almost any other single action," says Matthew Myers, president of the Campaign for Tobacco-Free Kids. "Menthol cigarettes are the single most important pathway to get kids to start smoking in the United States. It makes sense because what it does is coat your throat. It makes it much easier to get used to the harshness of tobacco smoke," Myers says. While Myers praised the FDA's new restrictions on e-cigarette flavorings, he called for the agency to go further and completely ban the flavorings. According to the plan released Thursday, the FDA would continue to allow adults to buy flavored e-cigarettes.